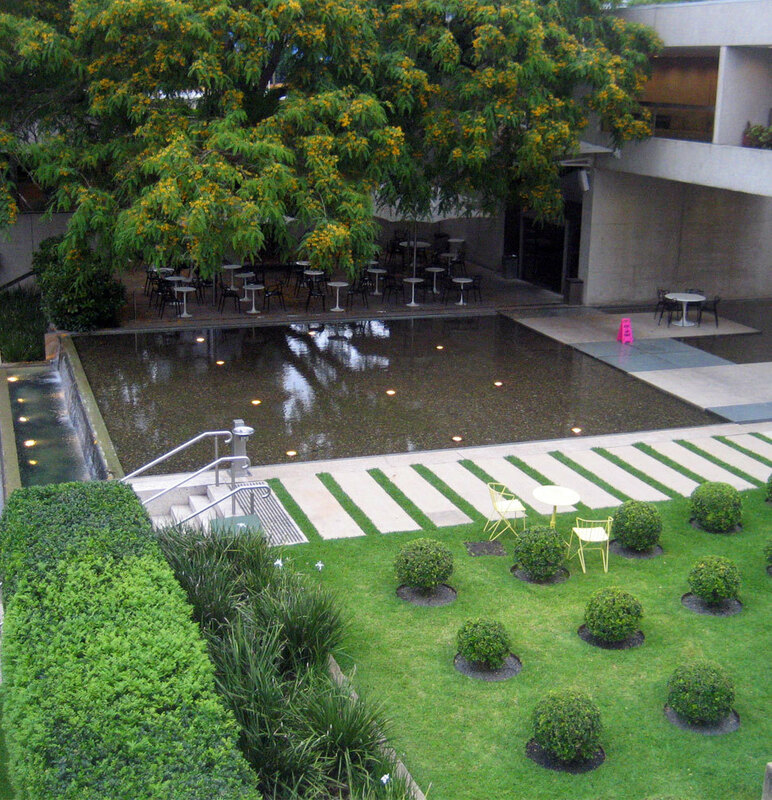 I have long had an attraction to the little parks that can be found around any city. Most are so small that you wouldn't even know they are there if you looked on a map, but they provide a welcome patch of nature even in the middle of the busiest city. I have already listed several of my favourite small parks. Here are 5 more great little parks in Brisbane. If you are a cyclist on the North Brisbane Bikeway you will probably have passed Yorks Hollow without even slowing down. Yet this lovely little park and pond is worth stopping at, either to rest after a long bike ride, or just as a place to relax. Located next to the Victoria Park Golf Course and down the end of of a cul de sac, you can be easily forgiven for not being aware of this park. Of course cyclists and pedestrians from the city will have seen it, but I rarely see anyone stop to enjoy this location. This means you usually have this place all to yourself. 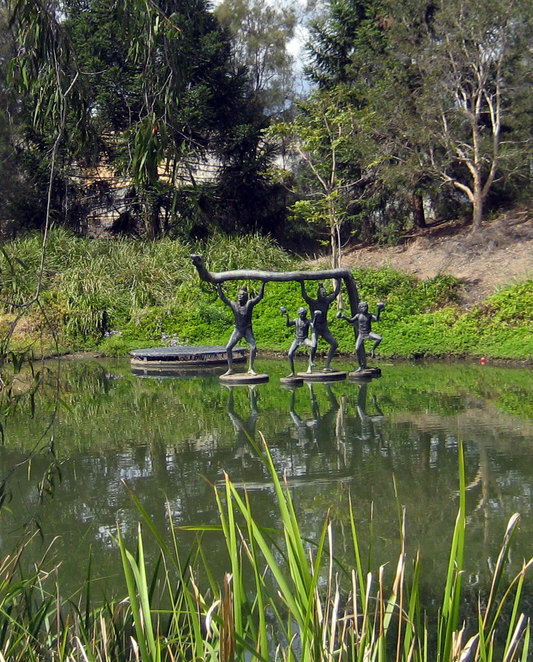 The main feature is the pond which contains a few interesting sculptors. Being a hollow of course, you are down below the level of everything else. 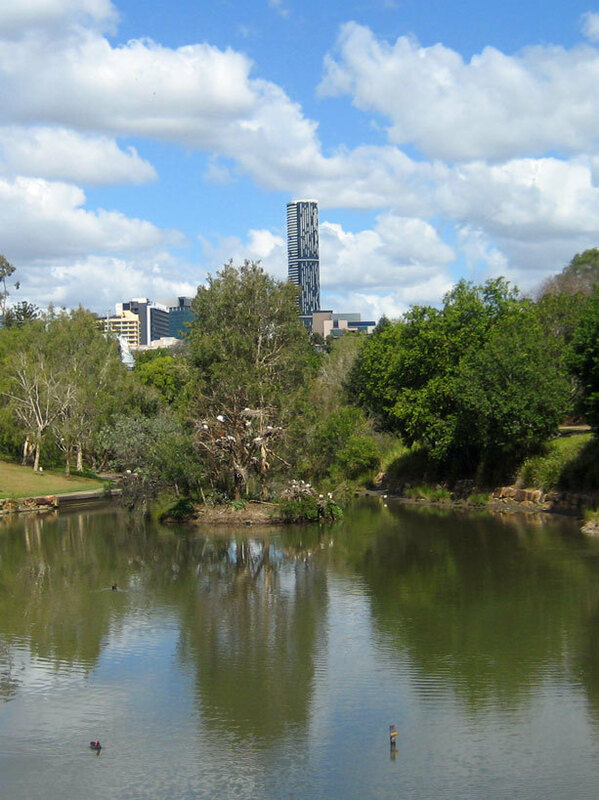 Despite being next to the Inner City Bypass, you feel far away from the hectic pace in life. So take a walk or a ride to York's Hollow and stop here for as long as takes to gain your calm composure. A little secret stop on a popular route. 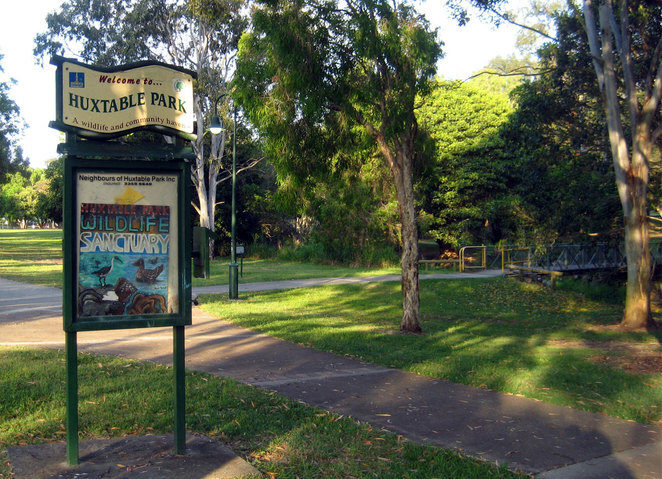 Huxtable Park is another park on a bikeway. 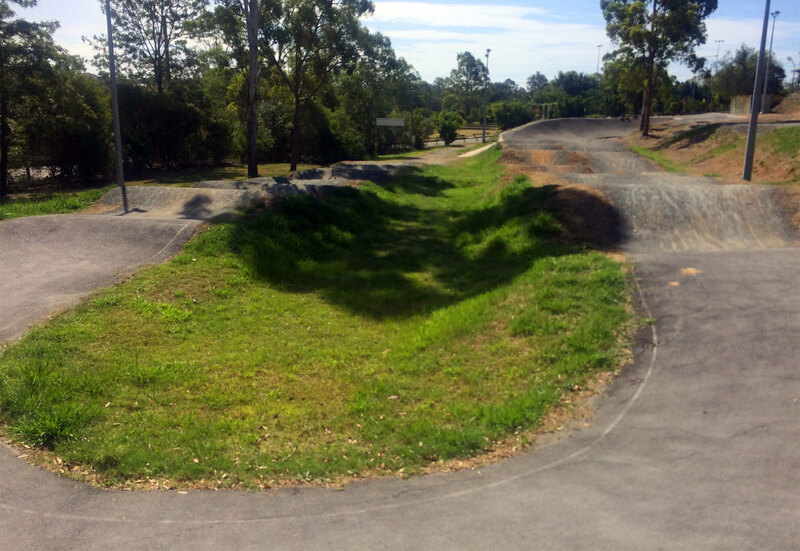 Huxtable park is one of many stops on the Downfall Creek Cycle Path, but what makes this place stand out from others is the wide range of features in this park. 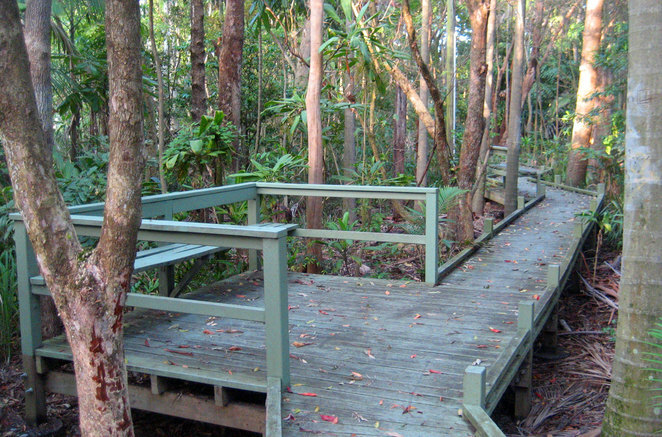 The main attraction is the little rainforest boardwalk in the heart of the suburbs. Escape the summer heat by retreating into this little enclave to sit and relax. It stands in contrast to most suburban parks which tend to feature bushland instead of rainforest. 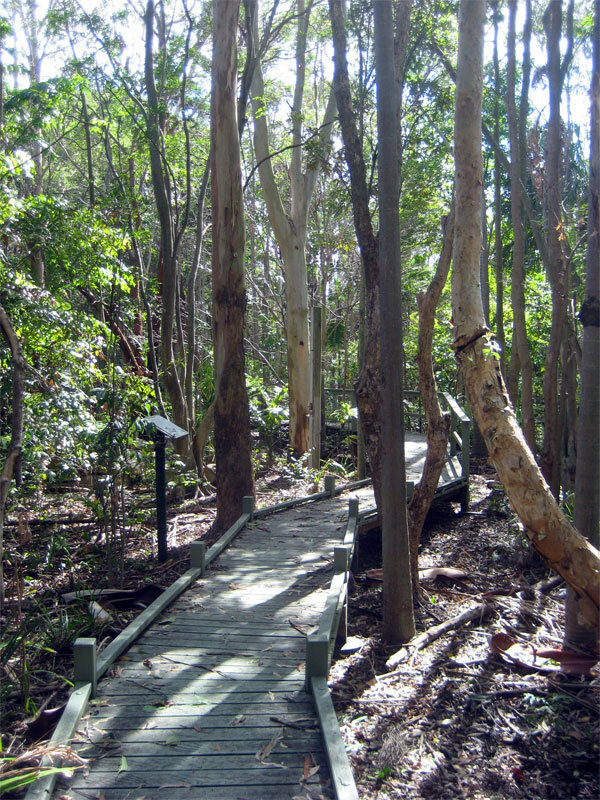 There is more to Huxtable park than just a rainforest. There are also barbecue areas (but unfortunately no toilets which usually stops people using the barbecues). 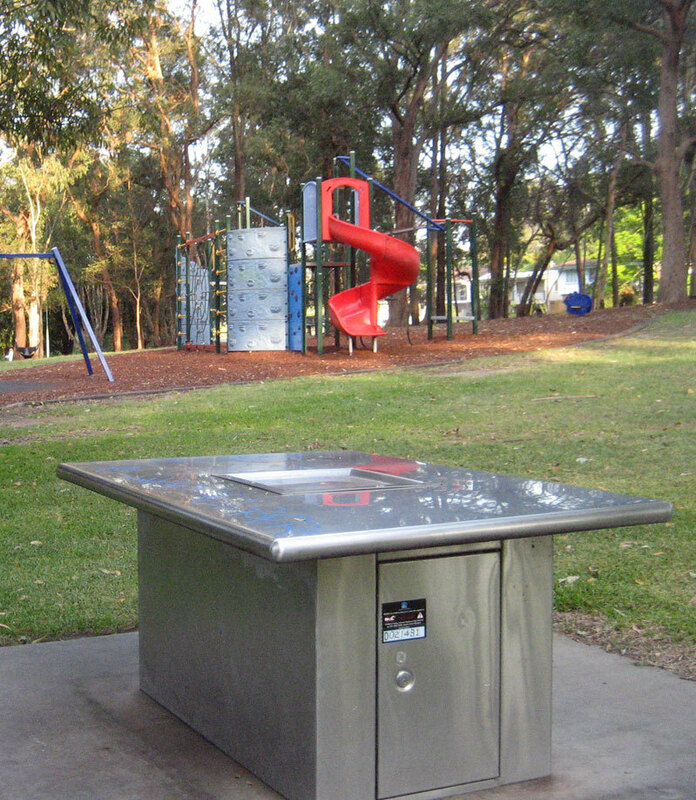 But it is great to just use the picnic tables to have a snack in the park. There are also three different children's play areas. One very traditional with swings, another with a little climbing wall and a third one suited to younger kids. This is a great place to take kids. There is a path that links to main cycle path forming a circuit. I often see parents teaching their kids to ride their new bicycle here. Older kids are not ignored either. There is a basketball half court for anyone who wants to shoot some hoops, practice some free throws or do a little one-on-one. There is also a reasonable amount of open grass for other sporting activities as well. 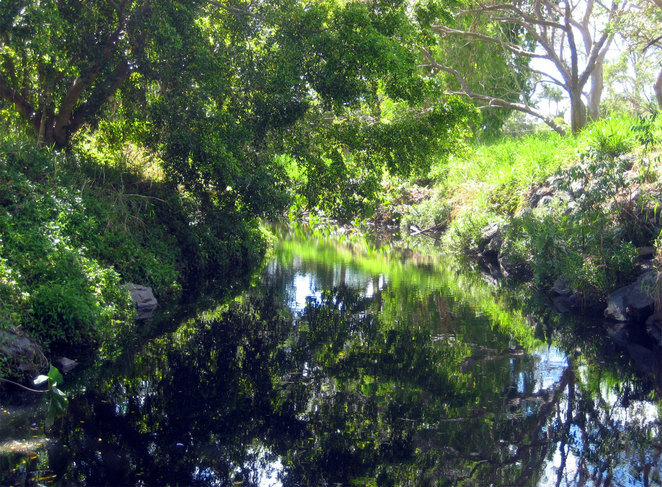 Even though it is a fairly small park, there are also some places you can explore. 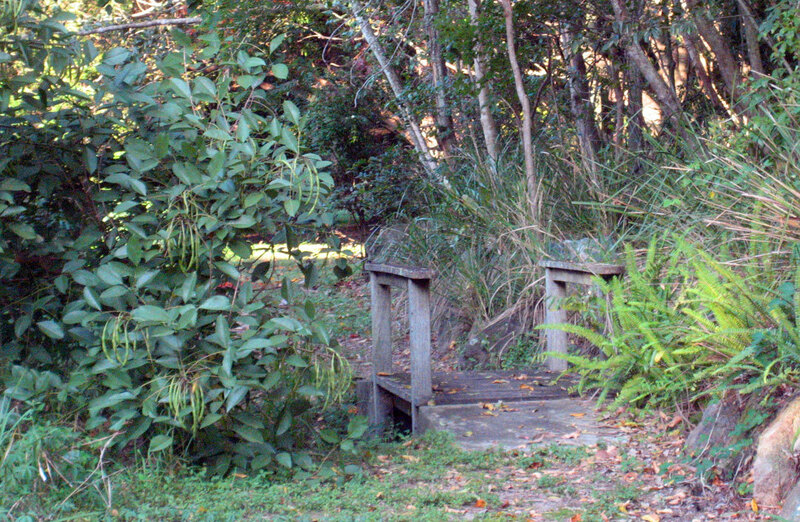 Sneak in behind the rainforest area and you will find a secret path with a little bridge. Overall the park is a fun little space to explore. Downfall creak attracts a fair amount of wildlife. The most common are the ducks, though please remember it is better not to feed them as bread is not a nutritious diet for them. The entire Downfall Creek path has numerous little places to stop and enjoy. 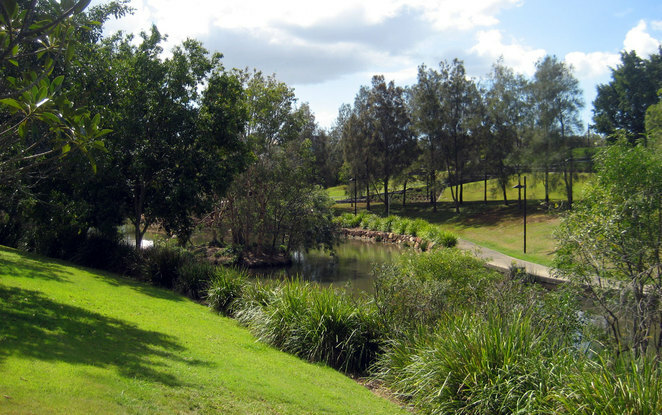 Huxtable Park is the secret location that locals frequent and is well worth a visit in itself or as part of visiting the area on foot or bicycle. I like the idea of a secret garden surrounded by walls and filled with treasures. I recently realised I have often visited such a garden. The cafe area at the Queensland Art Gallery is set in a little sculptor garden, over hung by trees and with a beautiful water feature that is part of the art gallery's watermall. You don't have to buy a cup of coffee to visit the garden. 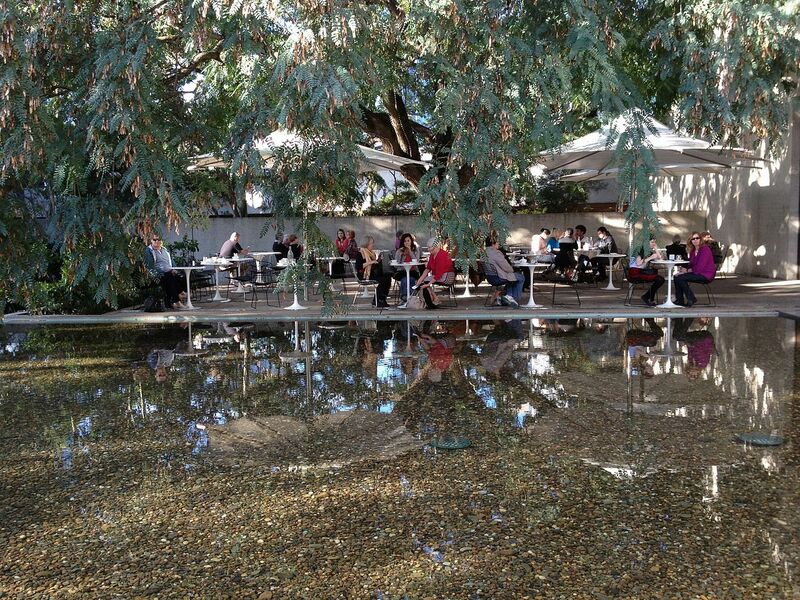 Instead just walk through the cafe to it, or take the side entrance is you are shy. But of course the coffee shop provides lovely meals and coffee. Nothing fancy, but still a nicely run cafe. This is the place I always take friends to have coffee when we are in the area. There is no reason why you can't just wander around here or sit on the grass under a tree. Unfortunately it is only open during gallery opening hours which are from 10 am to 5 pm. I think there are cafes in the Cultural Precinct with better food and drink, but none with a better location. 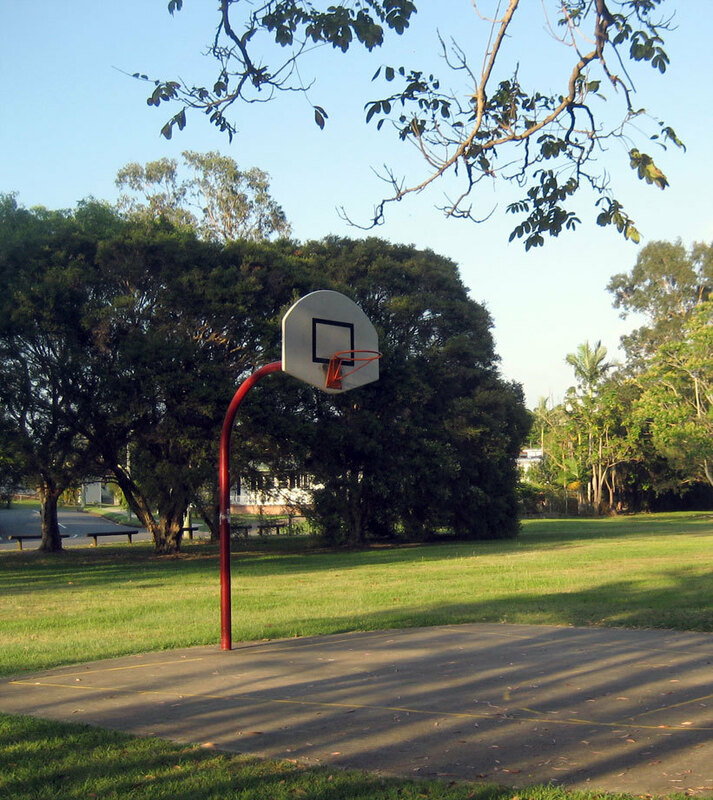 Underwood park is a fantastic green space that provides much more than you would expect. 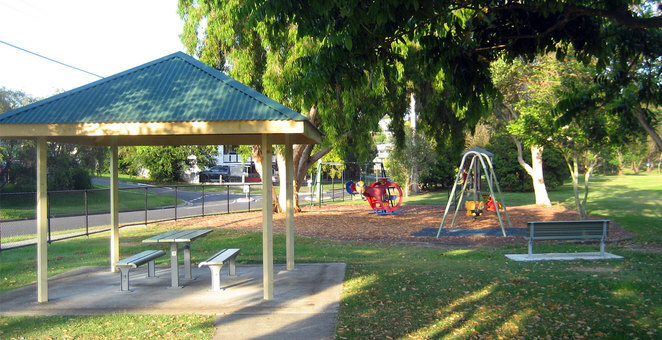 The main heart of the park are fairly standard sporting facilities and fields that you would find in many suburban parks. Down by Underwood Road the park also includes a little pond, rotunda and children's play area, making it is nice place to picnic or relax. 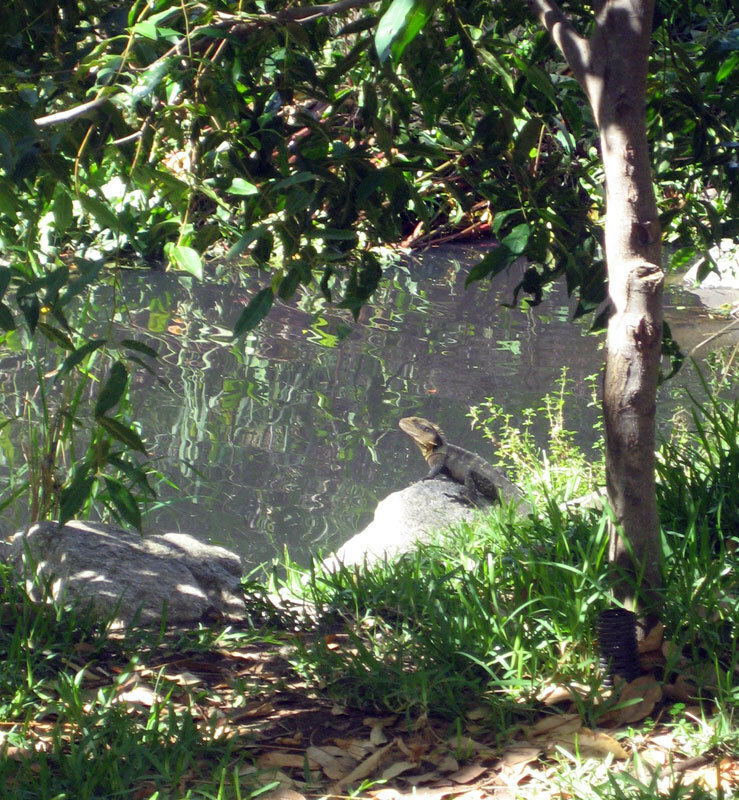 Further down is a larger pond. Well it is more of a small lake that locals often refer to as the duck pond. 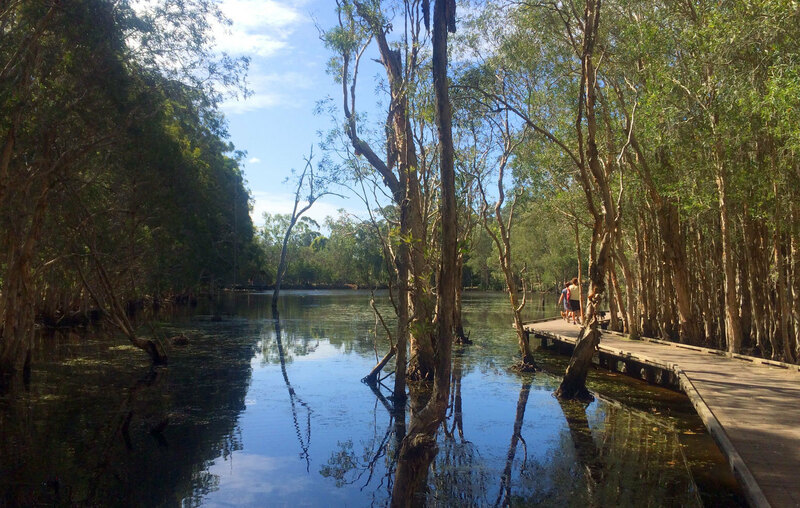 This wonderful little area has a boardwalk over the water, wood fired barbecues and of course ducks and other aquatic life. But there is even more to Underwood Park than that. There is a very cool BMX track even though I thought BMX bikes stopped being cool in the 1980s. Yes there are still plenty of people who enjoy riding BMX bikes. 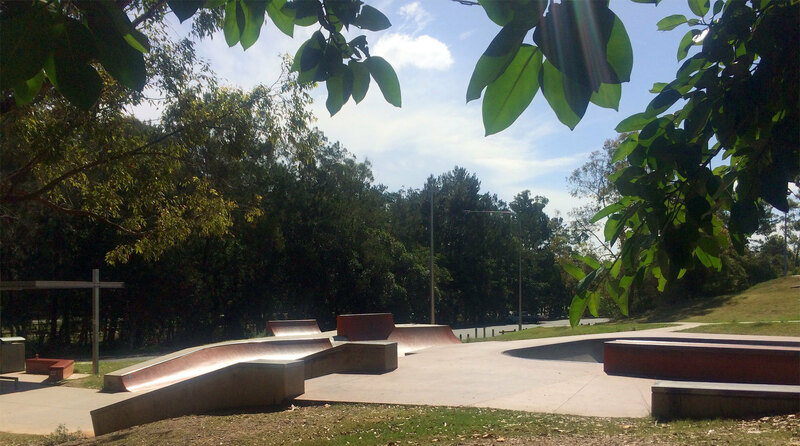 There is also a nice skatepark. Like the BMX track, I am not sure how popular it is. The park area tends to attract the more relaxed dog walking types than skateboarders. 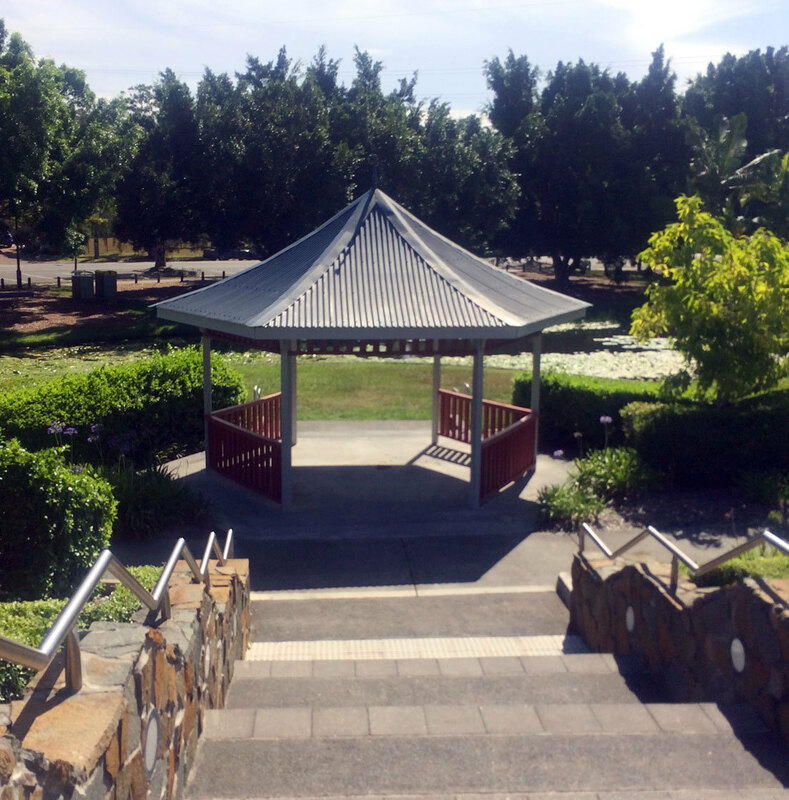 But if want more, then keep walking down Underwood Road and you can top off your walk by a visit to Brisbane's loveliest Buddhist temple, the Chung Tian Temple. 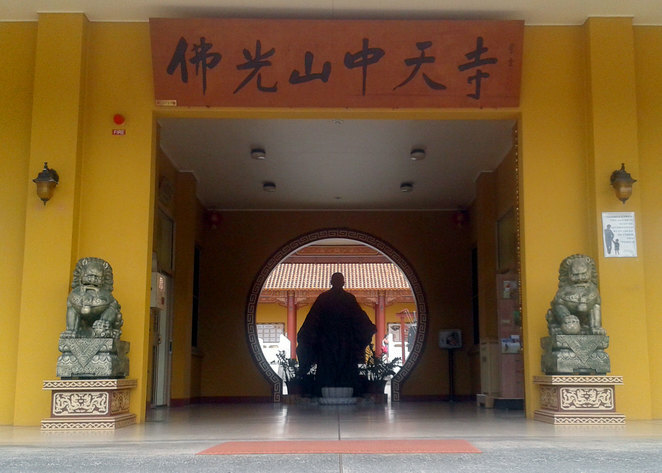 This mostly Chinese Buddhist temple is located in beautiful bushland with wallabies hopping around the grounds. The temple features a main prayer hall, mediation room and several prayer and activity rooms in the adjoining pagoda. 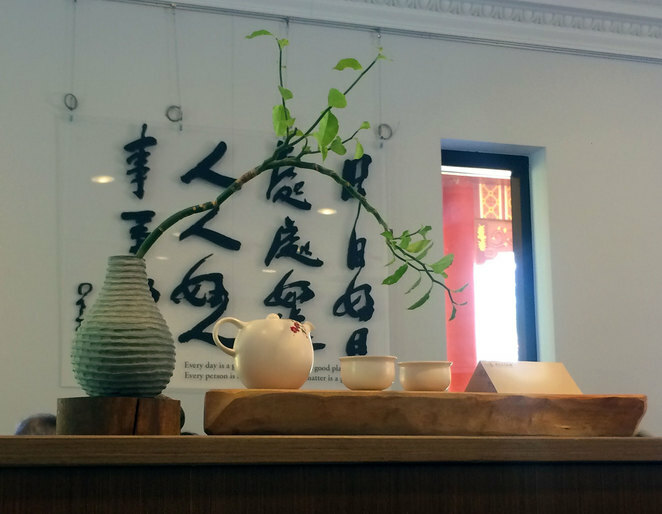 They provide instruction and services in English as well as Chinese. You don't have to be a Buddhist to visit. Buddhist temples can simply be relaxing places to sit. In addition there is the wonderful Tea Drop Tea House on the temple grounds. They have a wide selection of drinks, cakes and vegetarian meals. This is less about a park and more about the part of the park that people don't visit. 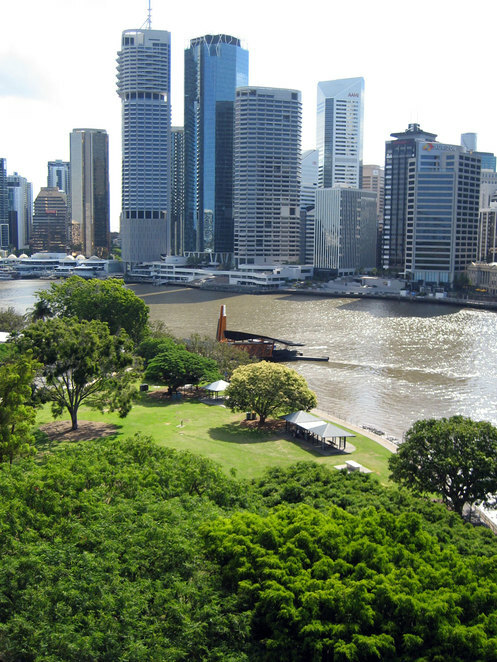 Captain Burke Park is the green space directly below the Story Bridge at Kangaroo Point. It is a popular location with people barbecuing, walking, jogging or cycling. 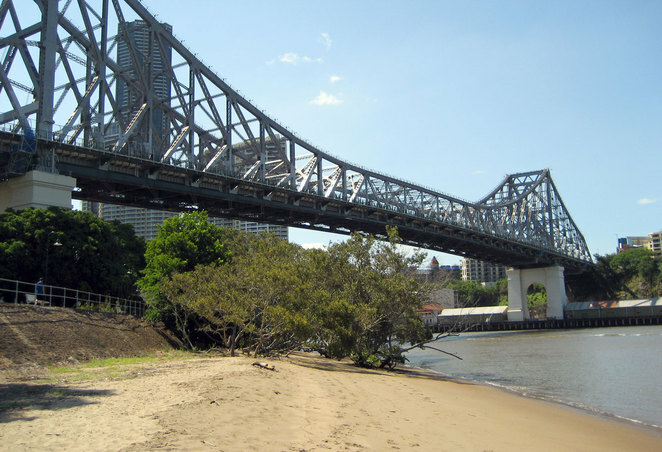 It basically is at the end of the river side walk that goes along the base of the Kangaroo Point cliffs. It also has a little beach just below the wall. There are stairs at both ends of the beach, so access is very easy and walking from one end to the other is no problem. Yet few people venture down to the beach and those that do seem to do so with a little trepidation. 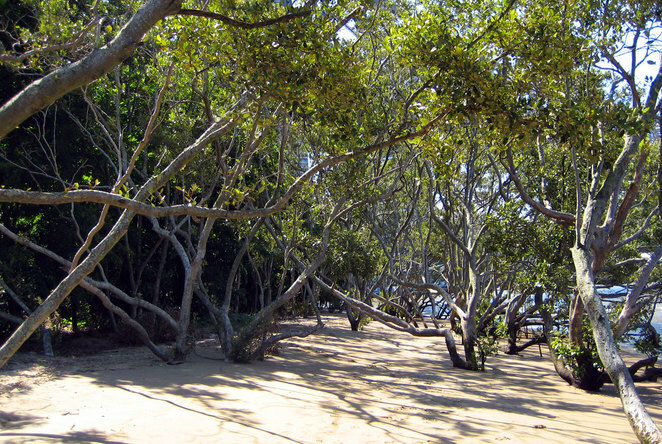 If you are looking for a private little space among the trees on the beach in the heart of the city, then this is the the perfect place to come. To my mind it is also just cool. It is a little beach walk by the river. Not that you would exactly want to sunbath or go for a dip in the river. Mind you it could become the place to go sunbathing in the city. This beach is what I like about little open spaces. It is something special and secret that most people pass by. 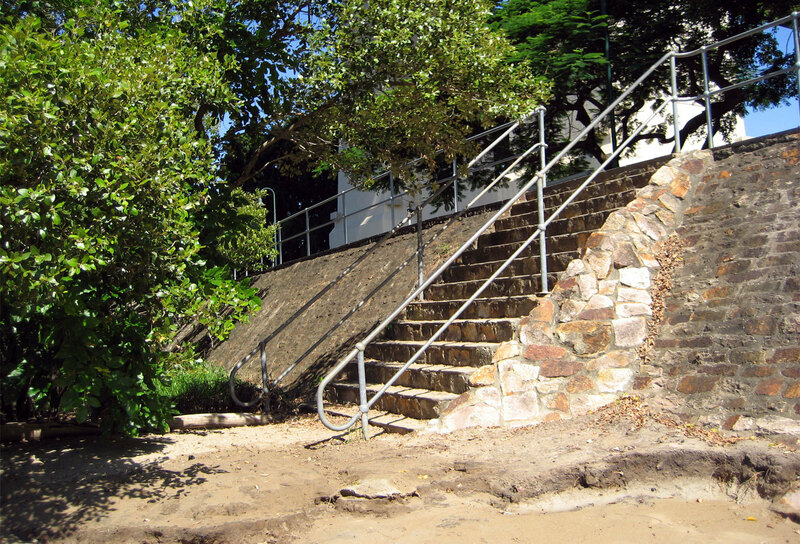 If you take the time to walk down the stairs and walk along the beach you will see things in a different way. Fascinating discoveries, Roy, thank you. 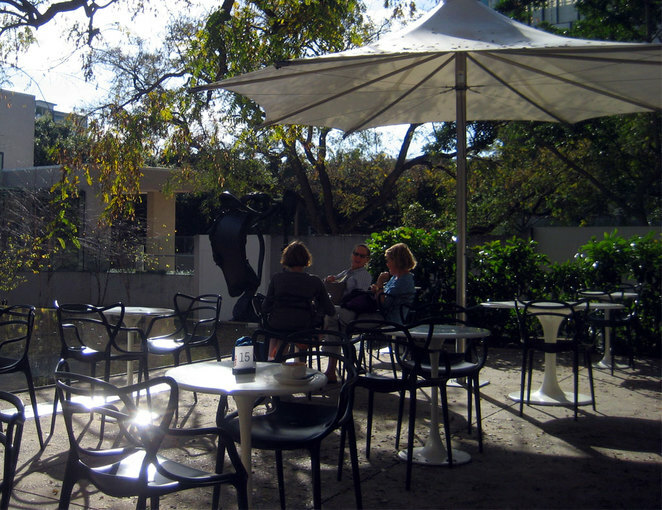 Of these, I've only been to the QAG café, so I will look forward to visiting the others. I've been to Captain Burke Park a few times, didn't know about the beach! Is the beach tidal? I imagine it is. So visiting at low tide would present more actual beach to enjoy. Is there room for cricket? That's the important question.